If you hate doing research, this itinerary has everything you need to know. In need of an idyllic escape away from the city but unwilling to do all that research? Well, if you’re looking for your next weekend getaway destination, then Bintan’s your best bet! Save yourself the headache and follow this 3D2N itinerary perfect for your next sojourn overseas. All the lazy planners out there – this one’s for you. Rejoice, for you don’t even have to fly to get to Bintan! The island is easily accessible from Singapore via a 60-minute ferry ride that departs from Tanah Merah Ferry Terminal, eliminating any pre-flight jitters and clearing the way for those #tropicalgetawayfeels. It’s easy to lose track of time; before you know it, the ferry begins to slow and you are in sunny Bintan! Book your ferry tickets NOW! Now that you’ve reached the shores of tropical Bintan, it’s time to officially get started on your vacation. With a plethora of accommodation options to choose from, it's no wonder you’re spoilt for choice. Depending on who you’re travelling with – family, partner or friends – let us make your life easier by recommending the best accommodations for your needs. It’s no secret that it’s hard to please everyone on family holidays. Nirwana Gardens, however, comes pretty close! Nirwana Gardens offers five accommodation options, comprising Nirwana Resort Hotel, Mayang Sari Beach Resort, Nirwana Beach Club, Banyu Biru Villa and Indra Maya Pool Villa. There is no shortage of things to do – the resort has its own adventure centre that offers flying fox, rock climbing and paintball, its own beach club for water sports and even its very own mini-zoo. Explore the resort grounds on a ninebot, zip through the air from a 25-metre tower at Happy Valley, try your hand at archery or simply relax by the beach. After a fulfilling afternoon indulging in all these activities, you’re probably famished and wondering where to head to for dinner. 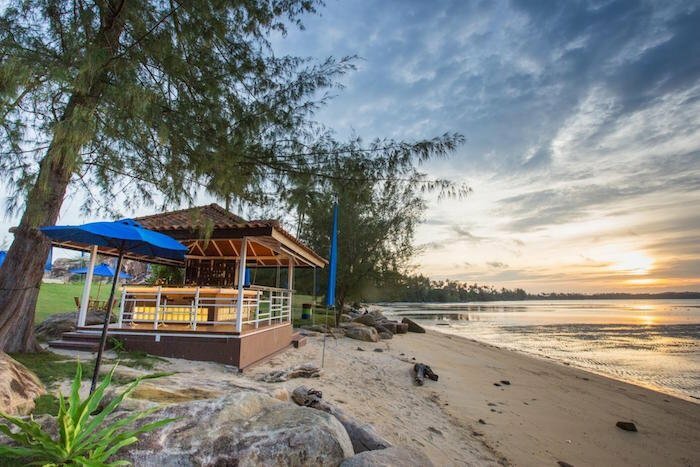 Nirwana Gardens has just the perfect place for you; a kelong seafood restaurant located within its compound. How convenient is that?! As seen by its “Crab of Fame” wall, it’s not hard to guess that Nirwana’s Kelong restaurant’s signature dish is black pepper crab. The crab meat is sweet with just the right amount of spice from the pepper for that added kick. Their other must-try dishes are the stir-fried butter prawns and gong-gong (sea snails). The breezy open kelong setting of the restaurant gives it a nice laid-back atmosphere for dinner. The most ideal time to visit would be just before sunset, where you’ll be rewarded within a stunning, panoramic view of the golden orb slowly disappearing in the horizon, lighting the sky awash with bright hues of pink and orange. You can also head over to Calypso Floating Bar located next to the kelong restaurant, for after-dinner drinks and a chill time! Tip: There’s an internal shuttle bus that brings guests all around Nirwana Gardens. The compound is really huge, and you’d be better off hopping onto the bus than attempting to walk from place to place. Click HERE to find out more about the different accommodation options in Nirwana Gardens! Perfect for a tropical getaway with your group of friends, Holiday Villa Pantai Indah is every individual’s dream come true. Boasting 139 pool villas with one or two bedrooms, the immaculate furnishings and luxurious facilities will definitely leave you with a vacation to remember. For that perfect insta-worthy shot, rent an inflatable float at the lobby. Head to the Sunset Bar for a cocktail against the backdrop of a gorgeous sunset. If you feel peckish, the property also offers 24-hour in-villa room service! Simply ring the concierge and have a piping hot meal delivered to you in the wee hours of the night. 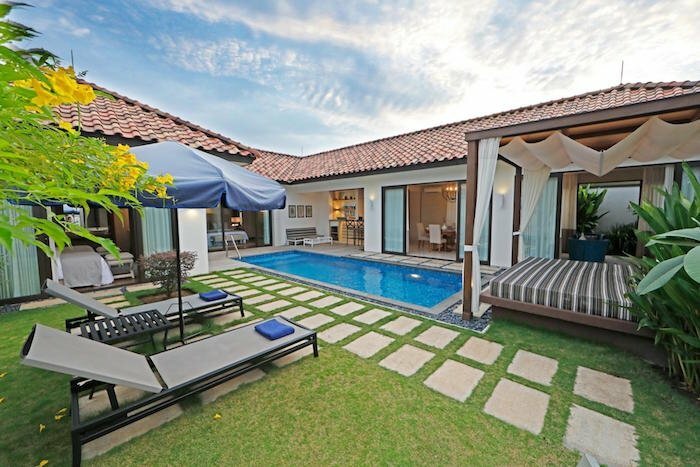 Click HERE to find out more about Holiday Villa Pantai Indah. The luxurious Banyan Tree Bintan comprises 64 exclusive villas nestled on top of a cliff overlooking the South China Sea. Each villa boasts a personal panoramic view of the South China Sea. What couples will appreciate most about this property is the feeling of exclusivity – you hardly see anyone around, and it pretty much feels like a stay in your own little private bubble. Incredibly cosy, and complete with a stunning view, you’ll not want to step out of your villa at all. Tip: Attend a cooking class with your other half! Compete to see who can whip up the best dish or simply enjoy the experience together. Either way, it’s a great bonding activity! Click HERE for more detailed information on Banyan Tree Bintan and book your stay today. When dusk falls, head to the Underwater World Lagoi Bay Lantern Park at Lagoi Bay for an illuminating time. The lantern park is home to 21 different kinds of animal lanterns, featuring the endangered species in Indonesia, such as the Orangutan and the Javan rhino. On top of that, be transported into the underwater world; delve into their world and spot some familiar characters there! 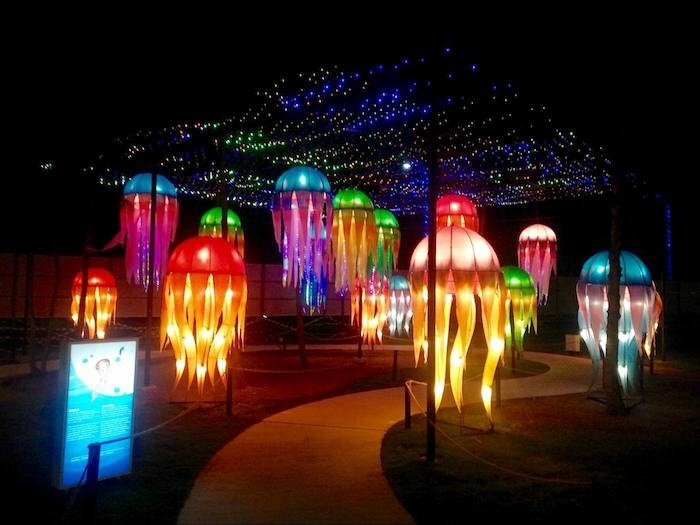 Don’t these multi-coloured jellyfish look incredibly stunning when lighted up in the dark? They make for awesome Insta-worthy backdrops too! Tip: If you’re feeling peckish after an evening stroll, head down to Warung Yeah which is just a stone’s throw away. Take your pick from local fares such as mee goreng and ayam penyet at pocket friendly prices. The capital of the Riau Islands, Tanjung Pinang offers you a unique glimpse into the lives of the locals, as you wander and explore the bustling streets. You’ll be able to satisfy your shopaholic urges right here as you pick out bargain buys from street vendors, ranging from dried goods to local souvenirs. If that isn’t enough, head to the new mall – Tanjung Pinang City Center to continue your shopping spree! Tip: The local markets only accept local currency and cash. Also, take a stroll along the jetty where you catch a boat ride to Pulau Penyengat, and admire these wall murals which depict the everyday life here on the island. Penyengat Island is a tiny island about a 10-minute boat ride away from Tanjung Pinang. Once you set foot on the island, the tiny roads and quaint architecture bring you back to the time of the Last Malay Kingdom in the 1800s. The island is the final resting place of the last kings and queens of the Malay Kingdom, where the tombs of national hero Raja Ali Fisabililah and poet & writer of Gurindam Dua Belas, Raja Ali Haji lie. It is said that, of the 2,500 residents on the tiny island, about one-third of them are related to royalty! The island is also home to the oldest mosque in Bintan – the Sultan of Riau’s Grand Mosque. The most interesting thing about this bright yellow and green building is that it was built using egg white as mortar to cement it together! Penyengat Island, along with its heritage sites, are nominated and pending listing as a UNESCO World Heritage Site! Tip: The island is a religious community, so do take care not to wear revealing clothes. Long pants and sleeved shirts are recommended. If you are looking for a white sandy beach in Bintan that is hidden away from tourists, Trikora Coast is your answer! There are four beaches that line the Eastern part of the island – Trikora Satu , Trikora Dua , Trikora Tiga , Trikora Empat . The coastline is dotted with rows of colourful wooden huts you can kick back and relax in. A favourite local hideout, many locals come here on the weekend to unwind in one of these coloured huts; having a picnic with family and friends or just frolicking on the beach. In addition, you can even visit a local boat-maker here and learn how traditional fishing boats are made! Tip: Buy a plate of Remis (a local shellfish type) and a glass of lime juice, and have a picnic in one of the huts. There are many cultural and heritage sites around Bintan, each with a unique story of its own. Located on the Southwestern part of the island is the first Chinese settlement in Bintan. This village is also home to a collection of temples, built to give thanks for the safe sea passage of the early Chinese settlers. Vihara Dharma Sasana has three temples within its grounds, and a series of majestic deity sculptures in its back garden. Another must-see in this village is the 200-year-old temple that has become entwined with a massive Banyan tree. Legend has it that this was actually the home belonging to a very kind man who had helped the homeless. After he passed, the villagers converted his house into this temple and believe that by coming to pray here, they will receive good fortune. Right at the Eastern tip of Bintan lies Panglong Village, the largest sea gypsies village in Bintan. It is the largest sea gypsies village situated right at the Eastern tip of Bintan. Traditionally, sea gypsies, or Orang Suku Laut , are a nomadic tribe that thrive living off the sea. Today, most of the Orang Suku Laut communities have become semi-nomadic. Their way of life, however, is still very much reliant on the symbiotic relationship with their surrounding mangrove swamps, rivers or sea. As you roam around the stilt houses and makeshift boardwalks, catch a glimpse of the residents going about their daily business such as mending fishing nets, drying salted fish, and repairing their wooden boats. Tip: It’d be great if you could bring along some snacks as a treat for the children. After a long day of exploring, head to Rimba Jaya, a local hangout that comes alive in the night. The entire Rimba Jaya area is literally a foodie’s paradise; it’s home to a food centre and other unique cafes. Head to the night market for cheap local delicacies and feast on tender sticks of satay, fried mushrooms and more! Or if you’d like to check out Bintan’s burgeoning cafe culture, there’s a Canopy Cafe which is known for its delightful matcha latte, Tomo restaurant for Japanese and Korean delights, and Loco for refreshing Taiwanese shaved ice. Tip: Come with an empty stomach and get ready to FEAST! The cafes in the area can get quite crowded, so try and head down around 5pm local time. Our mantra is always to start the day off with a good breakfast. Dine with the locals at Pujasera, a local hawker centre that offers a huge spread of authentic flavours at reasonable prices. The nasi padang , maggi goreng and goreng pisang (deep-fried bananas) at Pujasera are popular choices, but we especially like the goreng ketan hitam (deep-fried black glutinous rice). The batter is crisp and light and the glutinous rice is fragrant without being too sweet. To top it all off, pair your meal with a cup of kopi susu (coffee with milk). Utter perfection! Tip: Buy your local SIM card here, and there is also a bank nearby if you need more local currency. If you like to have a splashing good time, Treasure Bay is the place to be! Treasure Bay is home to a dazzling 6.3-hectare Crystal Lagoon, with tons of water activities. Day passes are available for public entry. The Crystal Lagoon is a man made seawater lagoon, allowing you to frolic in it without worrying about strong currents or sea creatures. If you’re feeling adventurous, we highly recommend trying the Jetovator or underwater scooter. Plus, you can also do stand up paddling, wakeboarding, kayaking and more! Click HERE for more details on what water sports you can find in Bintan. If you just can’t get enough, go kayaking through Treasure Bay’s own private mangroves. 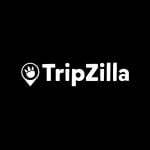 You’ll be led by an experienced guide who will give you a comprehensive look at the greenery and exotic wildlife, including silver leaf monkeys, snakes, monitor lizards, kingfishers, mudskippers, crustacean and small fish. Alternatively, if you’re not afraid of getting down and dirty, go on an ATV adventure drive for that dose of exhilarating speed and thrill! Sure, you’ll get muddy, but that’s just a small price to pay for all that fun! Tip: There are public washing facilities available at Treasure Bay. Before you head back to the ferry terminal and back to Singapore, end your trip with a little more adventure by taking a speedboat out to a nearby kelong to feast on superbly fresh seafood. Transport to and fro is available at most resorts, simply arrange with your resorts accordingly! It’s complimentary, and the speedboat ride only serves to add to the fun! Once at the kelong, be spoilt for choice with a large array of seafood – from local shellfish gonggong, to the usual fare of crabs and prawns, we only wished we had more than one stomach. 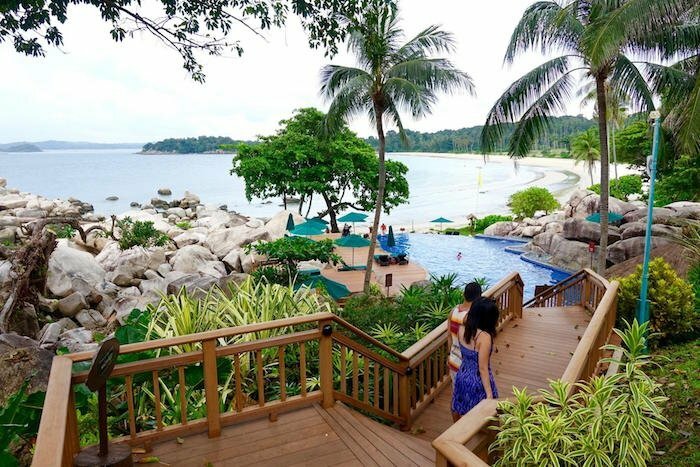 There’s just so much to do in Bintan, and spending 3D2N in this gorgeous part of the world is just the right duration to see the best of the island. For more information, check out Bintan Resorts’ official website . There’s really no time to waste in planning that next weekend getaway – Bintan awaits! Brought to you by Bintan Resorts.